Free-to-Play Dust 514 Will Require "Cover Charge"
CCP, developer of free-to-play online shooter Dust 514, is redefining the concept of "free" by charging for it. I remember a day when "free" meant there was no charge, no monetary transaction required. Free. Gratis. Take it and get out. But now it seems that in some corners, and in some ways, the concept has changed. Consider Dust 514, the free-to-play shooter for the PlayStation 3 that will tie in to the EVE Online MMO, as an example. It's free, but you're going to have to pay for it. "In the beginning you have to pre-buy credits, so you pay something like $10 - $20 to enter the game and you get the equivalent number of credits in the game once you do that," CCP CEO Hilmar Veigar PÃ©tursson told GamesIndustry.biz. "We call this the 'cover charge'." "You're really getting the game for free but you have to pre-buy credits in the beginning," he continued. "We might go fully free-to-play down the line, but in the beginning we have a cover charge just to manage the initial launch of it." PÃ©tursson said the idea of a "cover charge" emerged from CCP's desire to build a solid foundation for its games in a "slow and predictable way." Without that managed growth, he explained, it's tough to put together a "cohesive" community. "By growing it at the beginning we help to make a healthy environment initially," he said. I have no problem at all with an up-front charge for an online game, especially one that can be played indefinitely for no extra cost. After all, the comparably-priced Team Fortress 2 [at least until it too became "free"] is one of the best gaming values on the market. I'm just not sure that calling it "free" is really fair or appropriate. 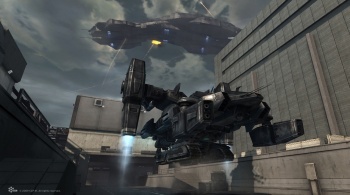 Dust 514 is slated to come out in the spring of 2012, exclusively for the PlayStation 3.